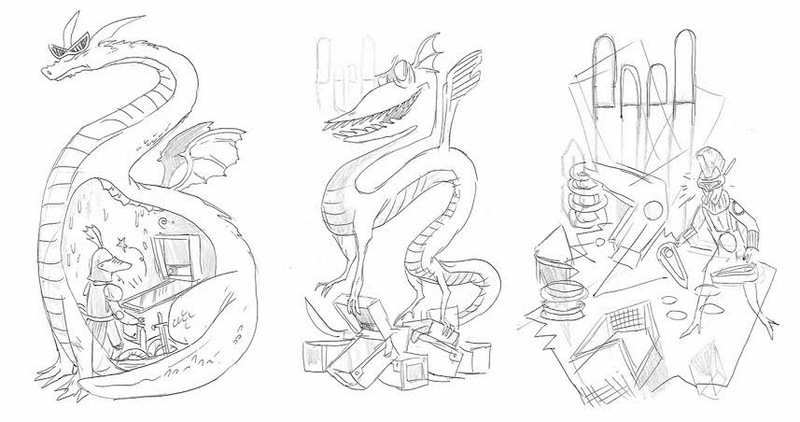 As a follow-up to Monday's post, here are the sketches that I submitted in order to get the design just right for the Southern Fried Gameroom Expo shirt. I know that these look similar, but I use this step as an opportunity to really dial in the overall look of the design. I'm actually really partial to the design on the upper left since it creates that overall circle shape, but I'm happy with the one that we decided on (lower left). It's sometimes a real balancing act to get the gamut of things in a design that a client asks for, while still adhering to some sort of order. Well, I'm finally back from Europe, which was rad. I managed to play a bit of pinball in every city I visited, so I'm going to post some recaps in the coming weeks. My first stop was the village of Angoulême in the South of France, where one of the largest comics festivals in the world happens every year. 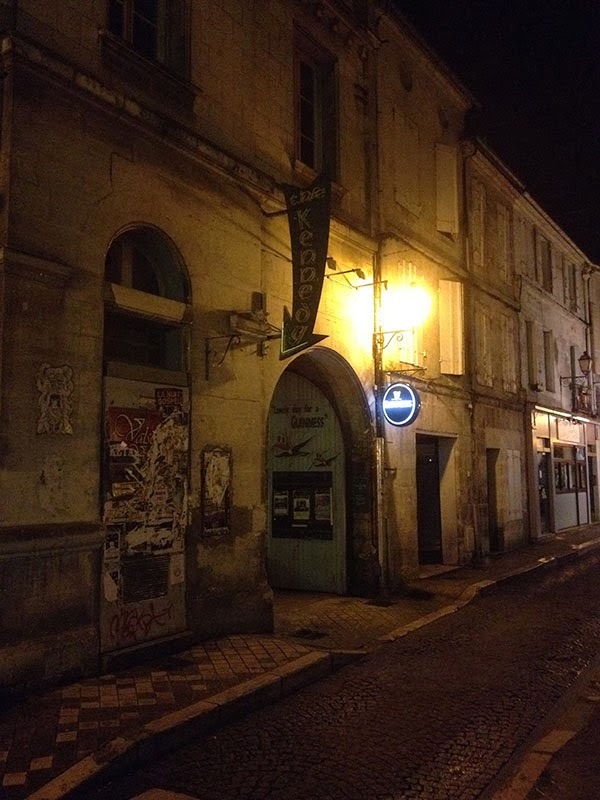 On my first night in town, I asked my hosts to take me to the bar where there was a Medieval Madness last year. I was hoping to live out The Pinball Dream! They took us to Kennedy's which was an Irish pub sort of a place. 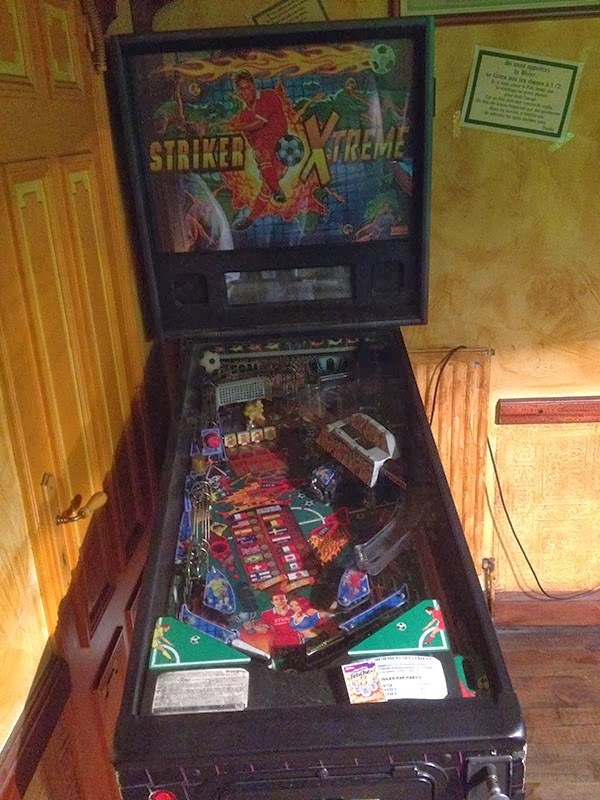 Sadly, the Medieval Madness had been swapped out for a Striker Xtreme. It was in the back room, in a corner, turned off. I was pretty bummed out, because usually when you spot a machine that's off, it means it's out of commission. It turned out that the machine was off, but only because the town gets so crowded for the festival that there will be too many people in the bar and not enough room for people to play pool and pinball. 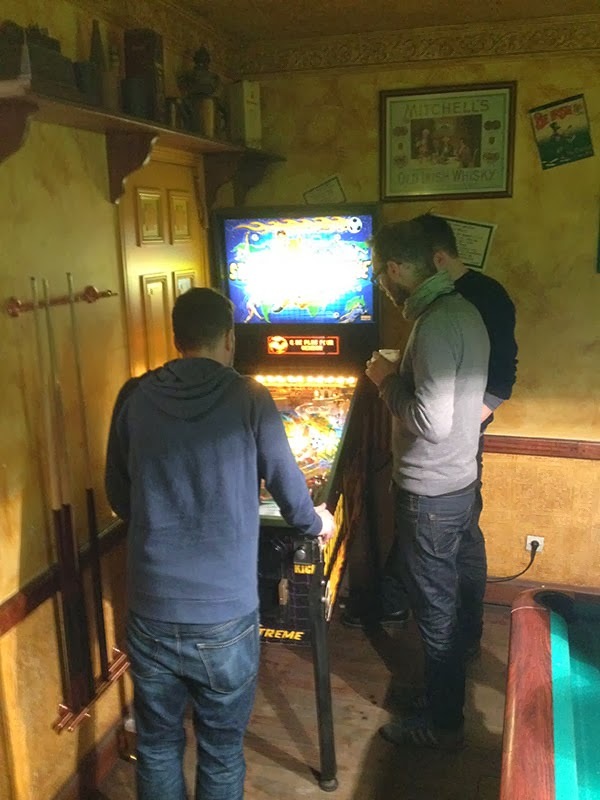 We turned it on and plugged in some Euros (1 Euro = 1 credit / 2 Euros = 3 credits) and started to play! The machine worked just fine and was actually pretty fun. We all played for a while and then suddenly I had an amazing ball that lasted forever (multiple multiballs, extra balls, replay, etc.) I feel like I had been talking up my skills, so I'm glad I was able to back up all my talk with some action! Sadly, my game was not good enough to make the high score board. Oh well, next time! Doing art for PAPA and Stern is, without a doubt, the bee's knees, but getting to do art for smaller shows and pinball leagues has really put a smile on my face! 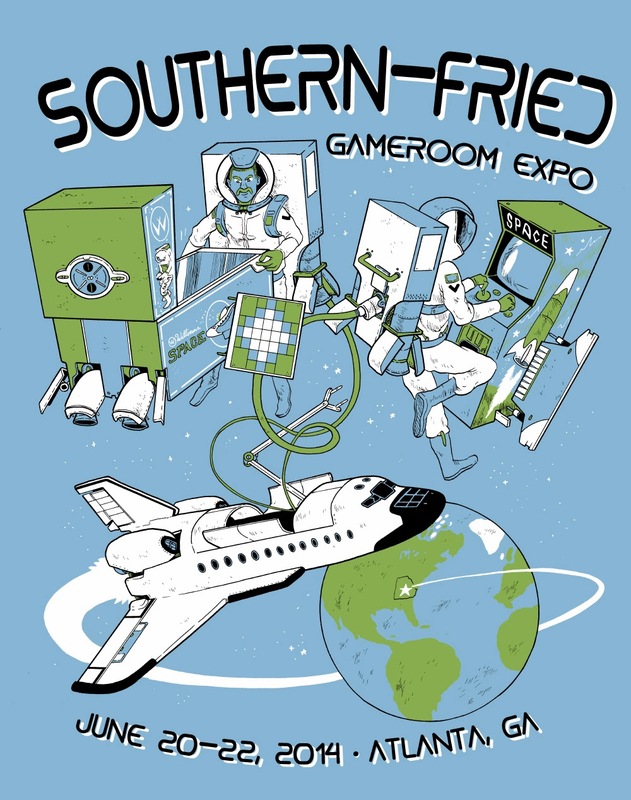 I recently got cold-emailed by the Southern-Friend Gameroom Expo looking for a shirt design. 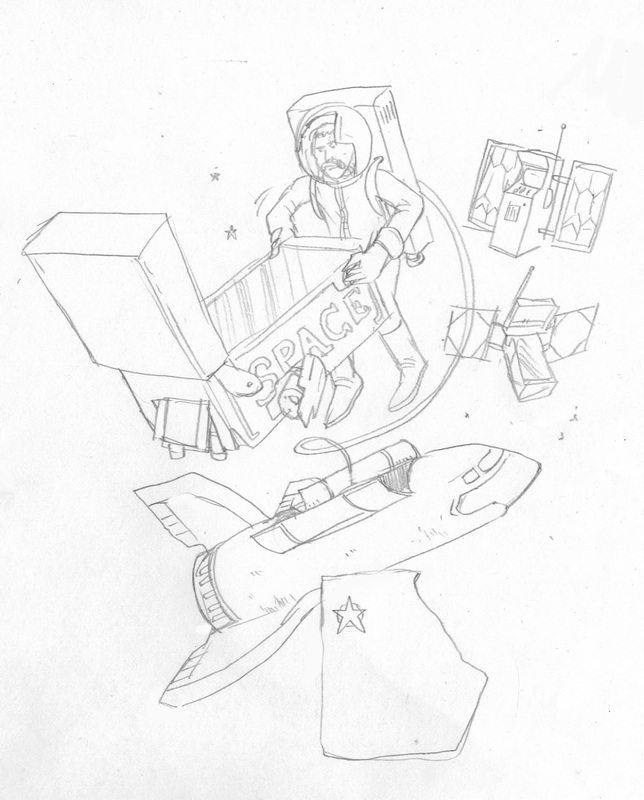 They wanted something that captured the idea of the pinball game Space Shuttle and its creator, Barry Oursler, who is a special guest. This is what I came up with! Are you going to be in Atlanta in late June? 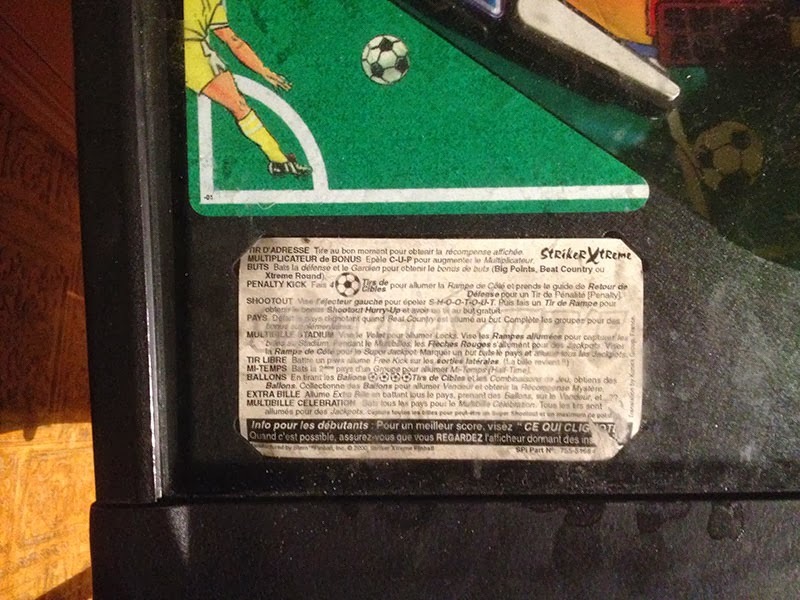 Do you love pinball and classic gaming? Get on this! It should be a blast!! Whoa! 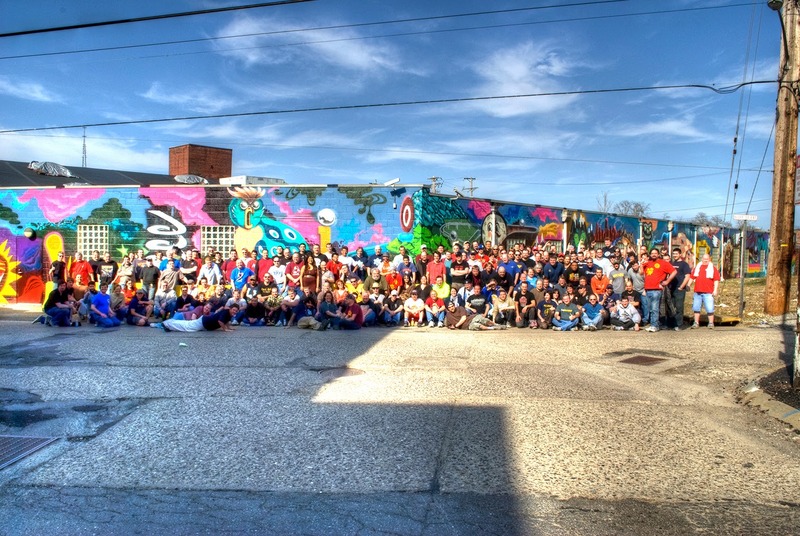 I stumbled on the list of players for Pinburgh today, and I am BLOW AWAY by how much pinball awesomeness is going to be under one roof! Man alive, I wish that I could make it down to see these veritable pinball gladiators duke it out! Check out the list of players and see all of the different leagues and affiliations that the players have! Link HERE! When I do a t-shirt/poster/whatever design for PAPA, Stern, or any client for that matter, I send in multiple versions of whatever they're looking for, as well as alternate ideas. There are, inevitably, ideas that NEVER get used and are lost to time...UNLESS I FIND THEM IN OLD EMAILS AND POST THEM HERE! Haha ha ha! This was a design for PAPA's Pinburgh tournament in 2013. I really like it! 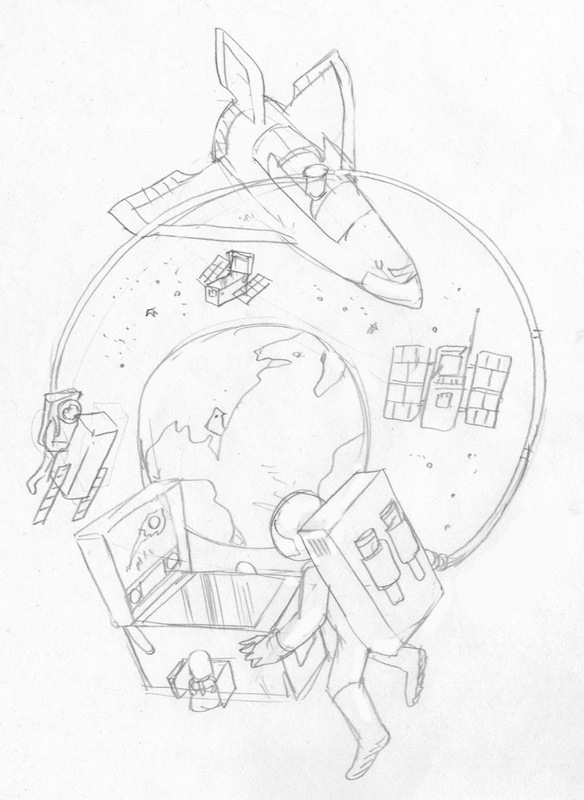 Maybe it'll come back and I'll finish the illustration, but for now, it'll hang out in the idea graveyard!